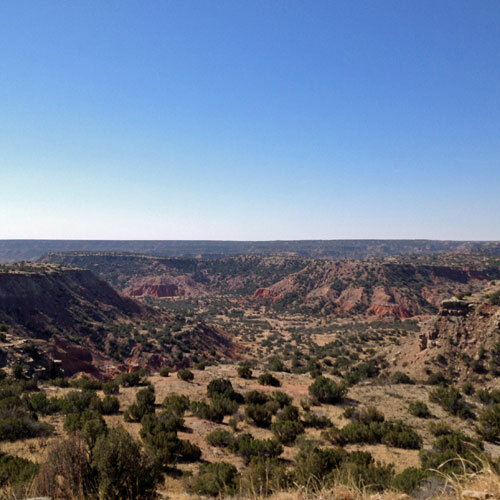 Everyone knows about the splendor of the Grand Canyon, but 700 miles east of that natural treasure is America's second largest canyon: Palo Duro Canyon. 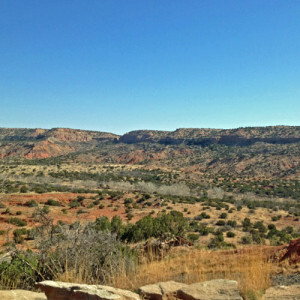 Named for the hard wood junipers that dot the otherwise relatively stark landscape, Palo Duro Canyon was once home to Native Americans, including the Apache, Comanche and Kiowa tribes. In fact, the canyon has supported human habitation continuously for at least 10,000 years. 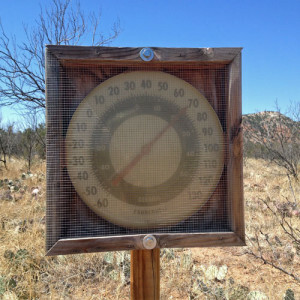 Some of the stereotypes about Texas are true, such as the summer heat. 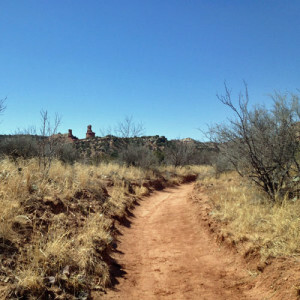 This is why I was grateful to have a chance to explore Palo Duro Canyon State Park for myself in April. On that day, there was hardly a cloud in the sky — which was more of a scenic blessing than a curse. Still, sunscreen was very much a necessity! Taking advantage of both the weather and the few hikers on a Tuesday morning, we took off on the park's signature trail: The Lighthouse. It's 2.72 miles one way, for a round-trip total of 5.44 miles. In the summer, temperatures can reach the 100s, but even on a picture-perfect day like ours, there was no water to be found, so it's always advisable to bring plenty with you. Armed with filled Camelbaks, snacks, and cameras, we hit the trail, stopping first at the striking Capitol Peak. 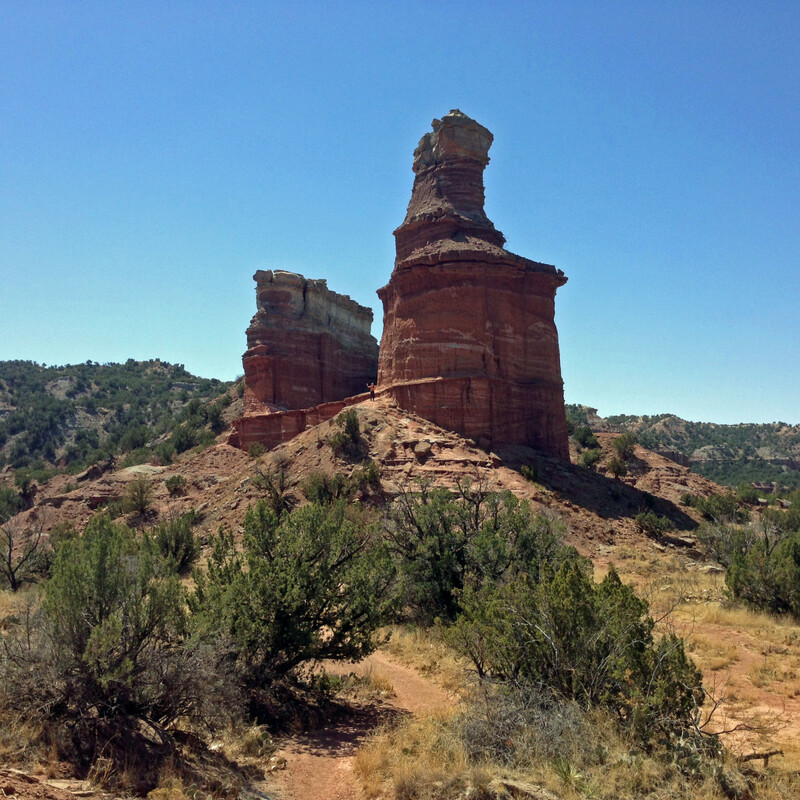 Notice the hoodoo on the left — a geologic formation caused by erosion. 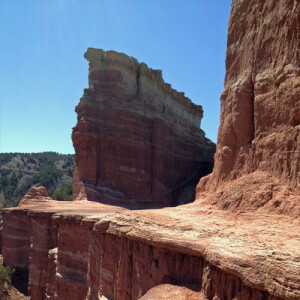 This hoodoo is named the Chimney and is often confused with the Lighthouse. In reality, it's much smaller! Rounding Capitol Peak, we arrived in Sunday Canyon, which is rich with fascinating geologic formations. The lowest strata visible are Permean in age. Like the previous formation, I would later discover that the base of the Lighthouse is made of the same Permean red claystone. Its appearance is rippled because it was created in shallow tides. That's right: hundreds of millions of years ago, this arid landscape was under water! During this relatively flat stretch of the hike, we gained our first view of the Lighthouse in the distance. From this distance, I could hardly believe we'd be hiking all the way to the Lighthouse. But then it dipped out of sight, and we walked on. After a split in the trail, we stopped to once again thank Mother Nature for the blessedly beautiful day, evidenced by the thermometer below. 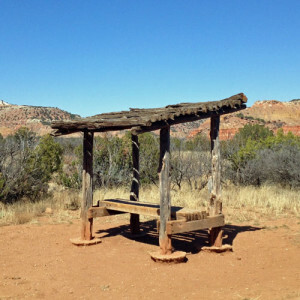 Although we were fortunate to be hiking in wonderfully cool weather, we knew summertime hikers must appreciate the covered benches that lined the trail every now and then. Most of the benches that didn't have a cover were sheltered by trees to provide some relief from the sun. As we continued hiking, ticking off the trail markers every tenth of a mile, we rounded another bend to discover that the Lighthouse was indeed closer now. We were making progress! We finally reached the base of the hill that would begin our ascent to the Lighthouse. After a few minutes, we encountered a picnic table and bike rack. This is where we got turned around and ended up taking an unofficial trail to the top by accident. 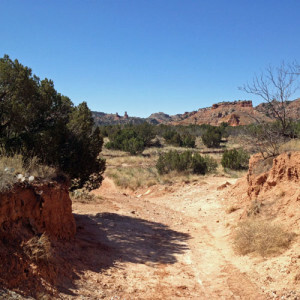 The correct trail is the one that is just left of the picnic table — not right of it! Both trails (official and unofficial) are wickedly steep, so make sure you wear your hiking boots, and don't be shy about grabbing rocks as you need to. Finally, we made it to the top unscathed and celebrated with victory poses. The trail didn't end there, however. I followed a rough path up the left side of the 300-foot-tall Lighthouse towards the rim that connects it to a neighboring formation of similar height. 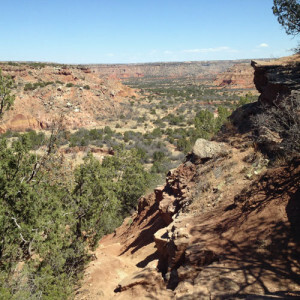 When I clambered onto the rim, I was in for the best experience of the day: a gorgeous panoramic view of Palo Duro Canyon, with absolutely no one else in sight. Up there, the wind was light, the sky was blue, and the day was perfect. I admit I might have let out a whoop or two. The photo shows the Lighthouse in front, Castle Formation on the right and surrounding scenery. After a well-deserved rest, we headed back down towards the canyon floor. This stunning view greeted us as we stumbled our way down the steep slope. The return journey used the same trail, so most of the sights were familiar to us at this point, but some previously hidden hoodoos, like this one, were a pleasant surprise. 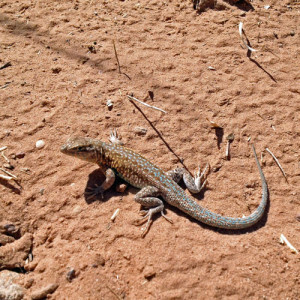 I also had an opportunity to photograph one of the quick-footed lizards that had been crossing our path the entire hike. The species was striking, with greenish-blue spots along its back. 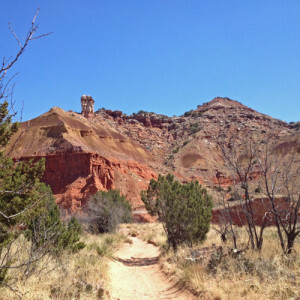 There is good reason the Lighthouse trail is such a popular one at Palo Duro Canyon State Park. With its multi-use trail, relatively short length, general flatness (until the final uphill scramble! ), and great payoff at the top, it's a wonderful hike. Of course, it's best enjoyed in perfect weather like ours, but if you do visit in the summer, make sure to bring plenty of water, food and sunscreen. 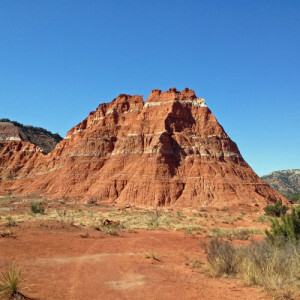 To enter Palo Duro Canyon State Park, the day admission rate is $5. Campsites are also available. 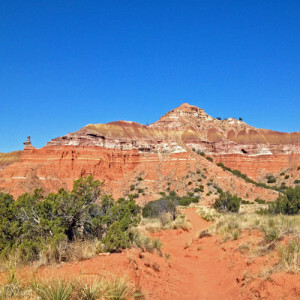 Have you hiked in Palo Duro Canyon State Park? 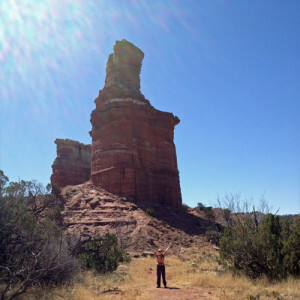 Do you have a favorite geological formation you discovered while hiking? Let me know in the comments.